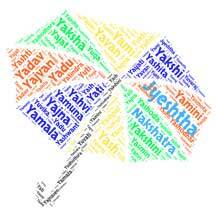 Sanskrit word Yuvati means young woman or girl. Yuvati is the zodiac sign of Virgo. It is also name of several Goddesses such as Durga and Usha. The name Keya is derived from Sanskrit, where its primary me..
Vibhavari is a sanskrit word which means Bright, Brilliant, .. The word Riti means style or fashion in the Vedic Sanskrit. ..